I've been meaning to blog about my holiday for a while now but I've never gotten round to it. We spent the first week in North Berwick, a seaside town on the Firth of Forth. We've visited for odd days before to view the famous Bass Rock which is one of the seven great natural wonders of the world, but this year, I decided we'd base ourselves there for a week. The finished bread - won't last much longer! Hubby is a keen twitcher (he hates that term) and passionate wildlife photographer so being close to the Bass and with the endless sandy beaches that South East Scotland and North East England have to offer, it seemed like the perfect family holiday. But what made it even more special was being invited to a gathering of some of the Edinburgh Cake Ladies. Months ago, I discovered that the lovely @Allison_Patrick who I randomly followed on Twitter lives in North Berwick. She mentioned that she'd organise a gathering but I thought no more of it. A day or two before we arrived, she asked where we were staying and it turned out she knew the owners of the cottage. Not only that but she manages a beautiful B&B right next door to where we were staying. On arrival, I did my usual tour of the cottage, rapidly assessing it for both for how good it looked before we unpacked and how much potential there was for Miss A to break something valuable. I swiftly removed the bottle of wine that had been left to welcome us from the lounge table and moved onto the kitchen. At which point I got excited that they'd also left us fresh bread, bacon, eggs and milk from the local farm. Better than the last place we stayed at in Norfolk where we got a packet of Happy Shopper bourbons. The fridge also appeared to be dominated by a rather large package of silver foil. Strange. 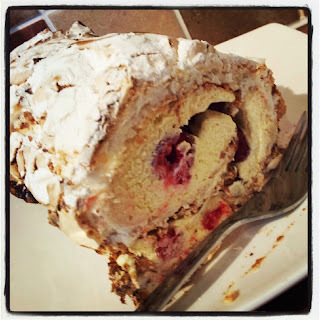 But perched on top of it was a note from Allison, welcoming us to North Berwick and saying that the parcel contained a coconut meringue roulade filled with raspberries and marscapone cream. I was overawed by such generosity from someone I'd never even met. And it tasted amazing too. 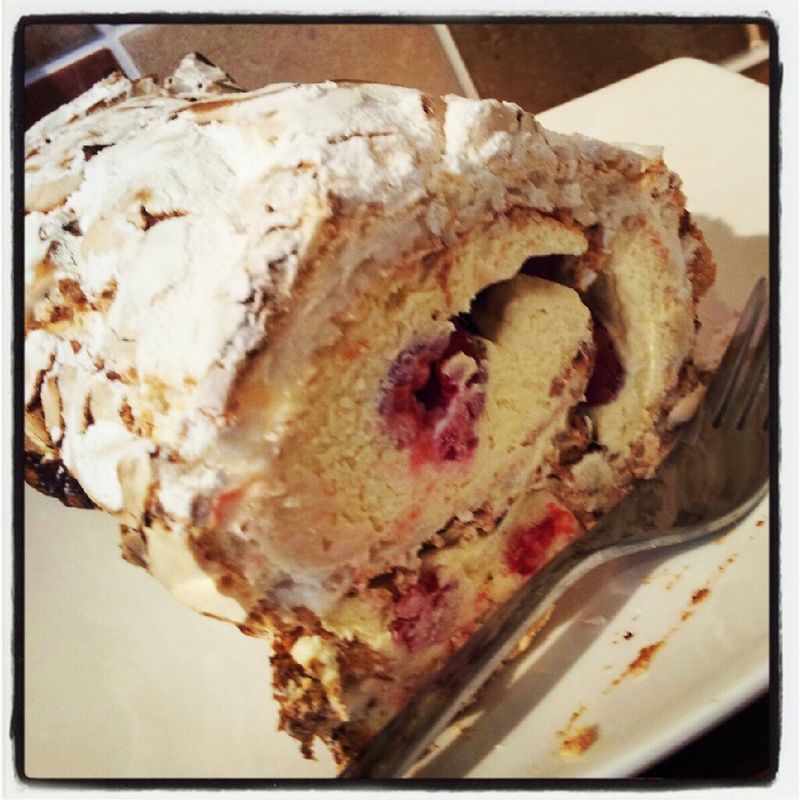 Allison's roulade which didn't last long either! Not only that but she convened a special meeting of the Cake Ladies where I finally got to meet @HungrySquirrels and @HarbourHussy as well as @Edincakeladies, @MadeByFi, @LouLouElla, @21UrbHousewife and @ShellyLovesTea. An amazing group of ladies and it made me finally realise that my husband's crackpot plan to move to Scotland might not be so bad after all. I've been sworn to secrecy not to reveal what went on that night, but I will say that the Buckfast was bought out at one point. Other than that, what happens at cake club, stays at cake club. This of course meant that I had a whole bunch of new people to tweet with when I got home - one being Fi Harvey (@MadeByFi) who last week blogged about this amazing summery looking loaf that I just had to try. 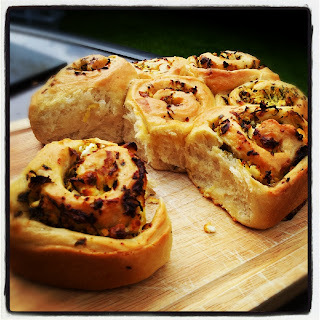 I had thought about doing it for my Mum's birthday barbecue but that falls right in the middle of the Olympic Challenge and I felt that this bread needed eating and this post needed writing outside of that madness so I made it this morning. It was a doddle to do and would be really amazing for a picnic or barbecue. The flavours were so fresh and the bread was so soft. I will definitely make this time and again. 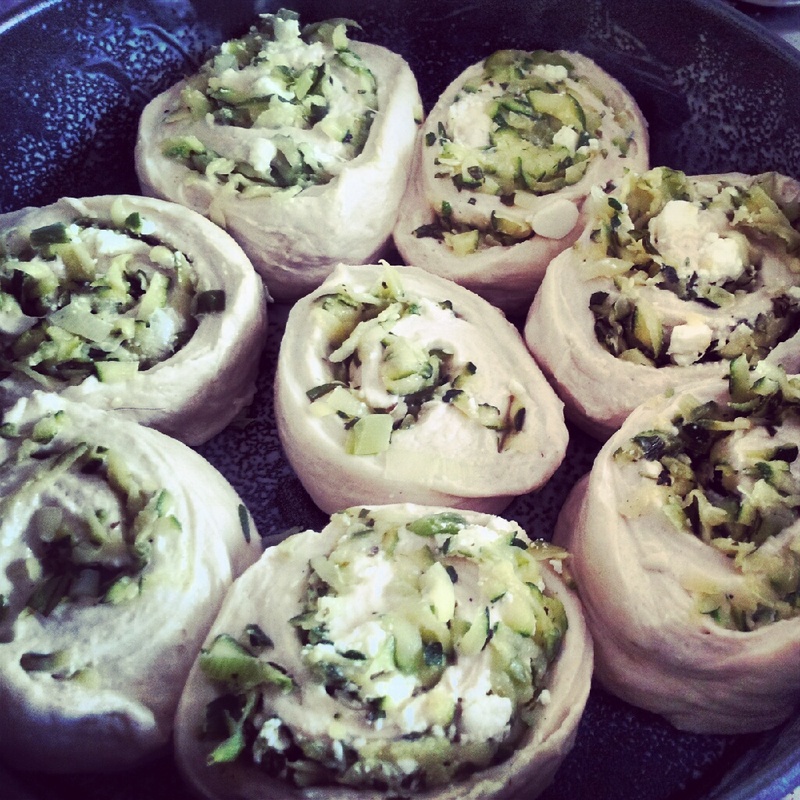 I'd never thought about tear-and-share bread, but I loved rolling the filling up inside. There are endless possibilities for that. For once, I didn't have enough bread flour in for the recipe, so I used half 00 grade pasta flour and I also substituted mint for the basil which made it taste a lot like Borek. I was a little worried when I sliced the loaf as the filling was desperate to escape but once the dough started to puff in the oven, it was nicely contained. One small mistake was baking the bread when I was waiting to go for a run. Having had a liquid-only breakfast (I can't run after eating anything), it came out of the oven and sat wafting its gorgeous summery smell all round the house making me want to scoff the lot. Luckily it also motivated me through the four miles and made a fab breakfast. Top marks to Fi for this recipe which you can find published online at the Broughton Spurtle. Now I just have to try and persuade the hubby to visit North Berwick again next summer. Usually, it's the other way around!